During cell migration, and in the absence of filopodia, lamellipodia detect the stiffness of the surrounding ECM in a process called rigidity sensing. Several models have been proposed that describe this process. 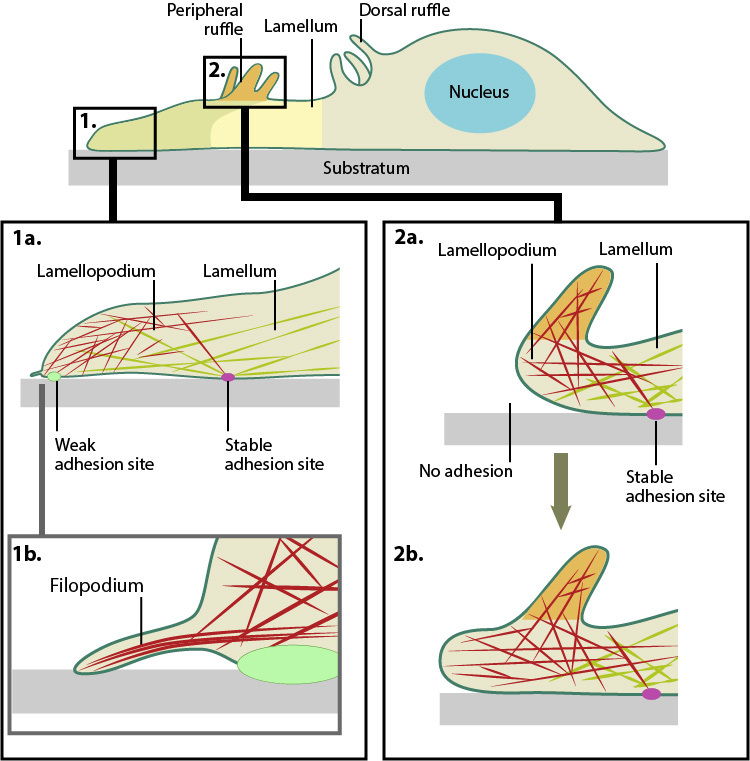 Actin filament assembly in the lamellipodium and retrograde movement of the filaments generates protrusive forces that drive cell motility in a specific direction. Lamellipodium (1a) and filopodium (1b) are common actin-based structures that are used to probe the cellular environment ahead of migrating cells. Adhesion to an underlying surface (ECM, other cells etc) determines the rate and direction of actin assembly during cell spreading and movement. During cell migration, nascent adhesions at the cell front ‘mature’ into stable adhesions as they progress towards the lamella. In the absence of adhesion at the leading edge (2a, 2b), the retrograde movement of actin filaments is converted into ruffles. Traditionally, it is believed that the lamellipodia and lamella are composed of two distinct actin networks , with the more dynamic lamellipodial actin lying on top of, and moving over, the more stable lamellal actin network . A more recent model suggests maturing actin filaments, in the form of bundled ‘arcs’, form in the lamellipodia and are drawn back into the existing more stable actin filament network of the lamella. This is proposed to occur by the action of myosin motor proteins, especially myosin II, which was found to reside in the lamellipodia at a defined time point; specifically at the peak of protrusion, just preceding retraction . In each model, rigidity sensing and cell motility is achieved through myosin II induced periodic contractions of the lamellipodial actin network. Signals detected by adhesions located at the leading edge are transduced by the actin network to the rear of the lamellipodium where myosin II-dependent contractile forces are generated . These forces subsequently pull at the lamellipodial actin network and result in variable migratory responses dependent on the strength of the adhesions. 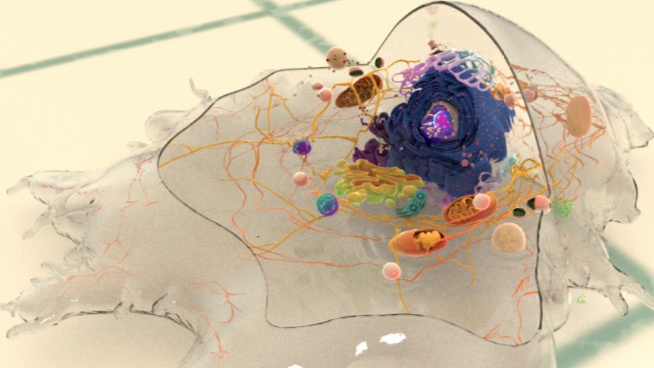 In the traditional model, when adhesions are strong and the leading edge is anchored to the substrate, the cell pulls itself against the adhesion and moves forward in the process. The lamellipodial actin network continues to be pulled backwards, over the lamella, until it is severed from the initial leading edge adhesion. The generation of new actin filaments ensures lamellipodial growth and protrusion continues and new adhesions can be formed . The retrograde movement of these filaments ensures myosin II remains in constant contact with the lamellipodial actin network. The duration of contraction is proportional to the width of the lamellipodium and in general, the more rigid the substrate, the stronger the signal, and the greater the contractile force generated . Conversely when adhesions to the substrate are weak, contraction of the lamellipodial actin filament network will cause the lamellipodium to bend upwards, detaching the leading edge from the substrate surface. This results in ruffling and transient retraction . Such events are characterized by an extension of the leading edge before retraction or ruffling occurs. Without strong adhesions for the cell to pull against the net forward movement is minimal. This type of pattern of migration has been noted in more slowly migrating cells, such as fibroblasts . In the alternative model where actin filaments are gathered in the lamellipodia as ‘arcs’ and pulled back into the lamella by Myosin II, adhesions, and adhesion strength, play important roles in the rate of migration. In this model, where it is proposed that a single arc may contact a number of nascent focal adhesions, the adhesions, which form over a wider region, act both as a break to slow the flowing actin arcs, and as the site of future protrusion. If the adhesions are weak, they will slip backwards further into the lamella without any net gain in forward movement. If they are strong on the other hand it is proposed that they will slow rearward flowing actin arcs and thereby mark the region where the subsequent protrusion phases will commence. A net gain in forward movement will be achieved so long as newly forming adhesions at the leading edge remain strong . In all models where adhesion strength determines the ability for mechanosensing and rate of cell motility, whether strong or weak, myosin-II is essential. How this protein is activated in this context is yet to be confirmed. MLCK (myosin light chain kinase) has been shown to be transported to the rear of the lamellipodium during the short window of time in between periodic contractions and so has been highlighted as a potential candidate for myosin II activation . Video. Lateral waves of the lamellipodium: Source: Giannone G et al. Cell (2007) 128:561-575. Permission: Prof Mike Sheetz, Mechanobiology Institute, Singapore and Columbia University, New York, USA. (http://www.columbia.edu/cu/biology/faculty/sheetz/) Differential interference contrast microscopy of mouse embryonic fibroblasts plated on fibronectin, 100x (22pix/μm), 0.33 s/frame.